Hello, lovers & friends! 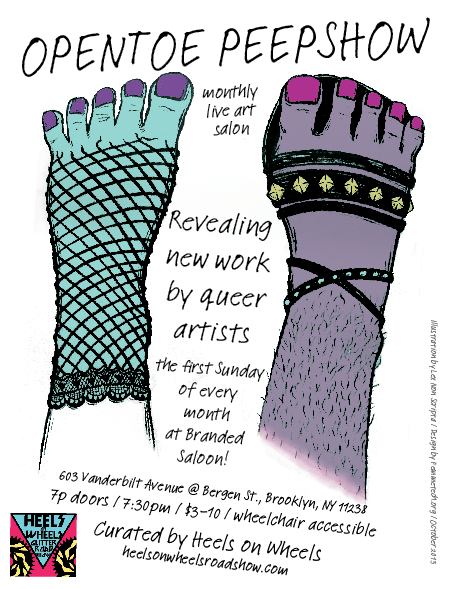 I’d like to invite you to Opentoe Peepshow Salon on Sunday, February 2nd, where I’ll be sharing more of my work. There’s a whole lineup of talented queer artists performing that afternoon. (And you should still have time to get home and catch the Super Bowl if that’s your thing.) Check out the Facebook event page for more information on who else will be there. You can find the basic event details below. Also, check out the event graphic below but ignore the time listed. The show this month’s at 3pm!